NOVEMBER PRIZE: A WATERMELON-SCENTED CANDLE! - What About Watermelon? You are here: Home / General / NOVEMBER PRIZE: A WATERMELON-SCENTED CANDLE! Fall has officially arrived. Actually, it arrived about six weeks ago, but it’s definitely here in my neck of the woods. I know that for two reasons: 1) Because I spent much of October raking leaves in our yard, and 2) My wife has unearthed our stockpile of fall-scented candles. Her collection includes all sorts of delicious-smelling options like Pumpkin Pie and Banana Nut Bread. They smell very much like November and make me very hungry every time she burns them. That temptation is the inspiration behind this month’s prize: the watermelon-scented candle. The answer, for most folks, is “yes,” but I’ve always been a firm believer that watermelon shouldn’t be confined to the spring and summer months. It should be enjoyed all year round, and that includes savoring its sweet scent even when there might be eight inches of snow on the ground. If you agree, leave a comment below. I’ll choose one comment at random from all the comments left on the blog this month to win the candle! This particular “Juicy Watermelon” candle is made by Yankee Candle, and it’s the big 22-ounce size, which means you’ll get 110 to 150 hours of burning time out of it. If you burn it for one hour every day starting in December, it’ll last until the beginning of May. Hello, spring! FEBRUARY PRIZE: A WATERMELON SALT & PEPPER SHAKER! MARCH PRIZE: WHICH OF THESE TWO PRIZE OPTIONS WOULD YOU CHOOSE? What better way to bring a summer day into your home when it is cold and snowy out after the holidays have past. It will bring hope to Spring and Summer coming. I agree with you !!! 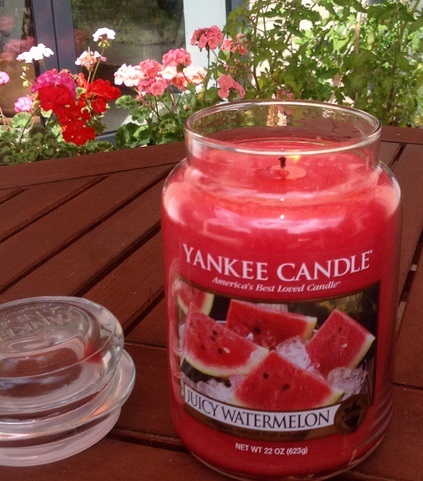 Those other candle scents are good but,I would love to fill my home with the scent of a nice juicy Watermelon and dream of the time when good ol’ summer time rolls around and brings us more of those delicious summer fruits.Thank you for bringing all things watermelon into our lives !!! Watermelon can be enjoyed any time of the year! I just love watermelon so much! I am always on the look out for anything watermelon. I really enjoy sharing a new find with friends!!! This would be so awesome. I have always loved watermelon. My husband and I were married December 28,2013 and will be celebrating our first anniversary next month. We never had the money at the time to have a reception but we plan on having one next spring and since my husband doesn’t like cake, I saw something on facebook where i can make a wedding cake (so to speak) out of watermelon and fruit and so that is what Im going to do. i can’t wait to see how it turns out. We’re very happy for you, Lisa! Good luck with the cake, let us know how it turns out! It sounds delicious! Congrats to Julia! She’s the winner of this month’s prize. Also thanks to everyone for leaving comments!